Finding your Water Way – Adults and Kids learning to swim. This entry was posted on February 19, 2013, in Learning to Swim, Swimcrest Moments and tagged Adult swimmers, how is teaching adult swimmers different from teaching kids?. Bookmark the permalink. Today, I got an email from a new swimmer, someone who has been training with me since November, but before that time, had no swimming experience. In fact, he was a non-swimmer. He’d tried to learn a few times, but nothing clicked, and at 40, it was finally time. Thanks again for all your help. The swimming thing has been something that has “troubled” me for a long time. I think for so long I have been ready but never found a situation that I thought I would be comfortable in. When I read your “swim story” on your site it really made it approachable for me and then your response to my first email was really supportive. You have really allowed me to learn at my own pace which has been really helpful because it is not easy to learn something new at 40. Your passion for swimming really shows, even in guiding me through my first 25 yards. I have many responses to this. First, of course, I’m so happy he feels this way. In my opinion, we should all be able to begin our swim adventure in a place that feels safe, comfortable, and designed to both increase our skill level but also our confidence. We need to learn to swim in places where we feel supported, not diminished for a lack of abilities. In my opinion, there are few things worse for any swimmer, whatever level you are. How can anyone feel safe, open to learning, or secure in their physical and emotional environment when they are insulted, made to feel less-than, or told that already, they are coming from behind? Instead, anyone learning to swim should be made to feel safe. Capable, if not yet knowledgeable. Bolstered by someone who supports them. And allowed to admit to and own how they feel about this experience. In this way, teaching adults and children to swim has much in common. For both, it’s about learning to exist in a foreign element and often, that is incredibly intimidating. It’s why my lessons often begin with play, and laughter, and learning to relax your body. Yes, swimming is about learning to put your face in the water, dunking your head, figuring out how to handle it when water goes up your nose. More importantly, it’s about being supported wherever you are in your swimming journey. It should NEVER be about telling you what you’re NOT good at, how deficient you are. I would never start a lesson that way when teaching a child new to swimming. Why would I feel comfortable doing so with an adult? Recently, I had another swimmer, a woman in her 50s, talk about her very real anxieties when it comes to swimming. As a relatively new swimmer, she is learning, step-by-step, her ultimate goal being to improve her performance in triathlon. My first step with her was not related to actual swimming at all. Instead, we sat on the side of the pool, feet dangling in the water, and I validated her fear and her feelings. Look–the water can be a scary thing. As one coach has told me frequently over the years, “The Water Always Wins.” It’s a phrase I have often come back to as I compete in open water. What I told this new student is that I believe we need to re-frame how we think about that fear and instead, consider it a RESPECT for the water. Respect for an element that is stronger than we are, and we must learn to use our bodies in a way that shows that respect, interacting and working with the water while understanding the power it has. I could see her body relax as we talked and I honored her feelings. In her first ever open water swim, she had suffered the experience of having someone swim over her, a common occurrence in open water races, and she needs time and skills to get over the fear that it will happen again. 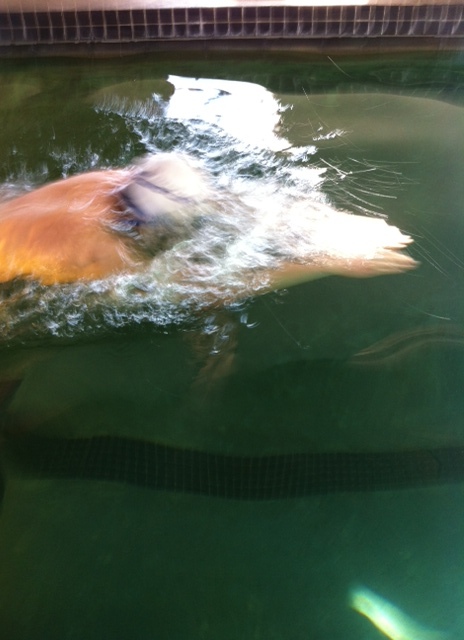 We talked and when she entered the water, her body was visibly more relaxed. My job as her instructor is to work with her while acknowledging and helping her work through her feelings, thereby allowing her to be open to hearing me, to trying new things with me, and growing her skill set so when it happens again, the panic will not paralyze her the way it did that very first time. Often, children are afraid when they begin their swimming lessons. Think about it. They are small, entering a foreign element that can, quite literally, consume them. My first exercises are about admitting that their fears exist, honoring that nervousness, and working with them from where they are. Having a pre-determined set of things they must learn at a certain pace fails to honor their feelings and sets them up for an oppositional relationship to swimming. Too often, swim instruction for both children and adults is a set of prescribed exercises, things that “must” be done to move from guppy to shark. This strategy of instruction never worked for me as a child, and I believe it doesn’t work for many people. Instead, why don’t we all start our swimming with talking? With play? With enjoyment? With discussion of how we feel about the water? With recognition of what we enjoy about the water? With talk about why we want to learn and what we want to learn? The more I communicate with my students, adults and children, using a variety of methods, the better. Ultimately, the more trust we will build, the more fun with will have, and the better their swimming will be.